May | 2016 | shigekuni. 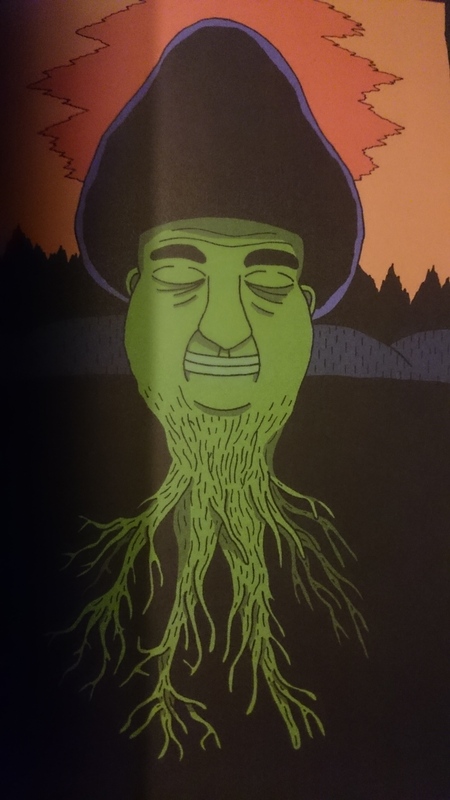 I have never read a graphic novel by a Swedish creator before, but if The Troll King is any indication, Swedes like their comic books like they like their rock music: weird and intense. I think the only book I read recently that approaches Karlsson’s interests and the direction of his work is Jeff Vandermeer’s recent Southern Reach trilogy of novels. 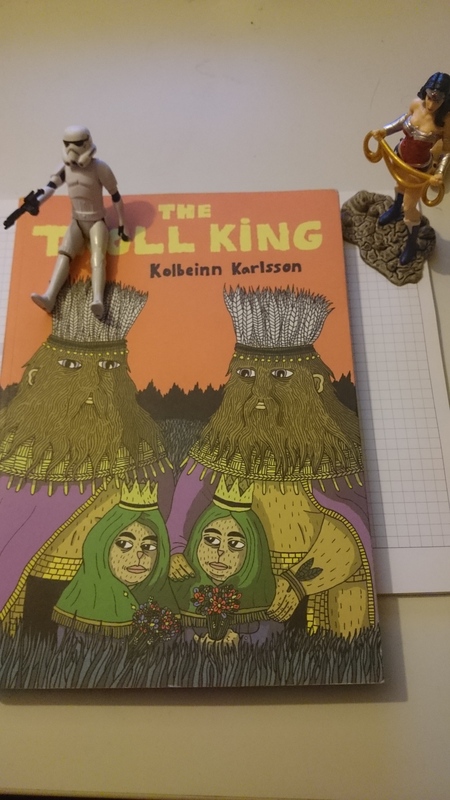 The Troll King is a novel-in-stories, I guess, but given how coherent the whole narrative turns out to be when we read the last story, it may just be a novel, full stop. The book starts off strange and then just keeps getting stranger until a surprisingly emotionally resonant ending. Reading the book I was so overwhelmed by its themes, its art, its contradictions and its metatextual elements that I didn’t even consider the direction the narrative was taking until the final of the book’s stories just took me by the hand and led me down a narrative path that proved to be as poignant, as it was strangely common, almost formulaic. Karlsson draws on a broad range of influences, from Nordic myths to anime/manga, he writes a story that is both tender and emotional as it is filled with a strange physicality. 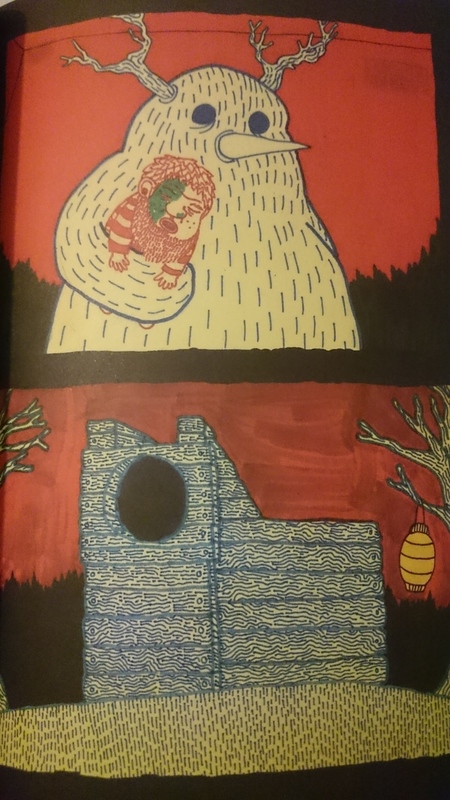 If you feel weird about two large bearded men/monsters having a loving and sexual relationship, depicted fairly directly, you won’t even make it past the first section, and you’ll miss fever dreams, the murder of birds, a lot of other (small) male genitalia, death, birth and rebirth and other topics. All of it realized in an art style that somehow straddles the divide between crude and precise drawings, colored with inspired abandon. It is a dark tale with a sweet ending, a violent story with quite a few funny visual jokes. 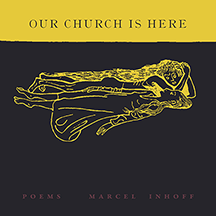 If we look for the way the book relates to its audience, how it employs perspectives and speakers and voice, we (or rather: I) get the feeling that Karlsson is sometimes seduced by his own powerful artistic vision to the detriment of really mapping out all the book’s details. Would I recommend it? The blurb on the back of the book suggests that Karlsson and Miyazaki are kindred spirits and that’s not far off the mark. If you feel like reading a version of Miyazaki that is darker, more physical, more violent, more racist/reactionary, more explicit, but similarly inspired of and reverential towards nature, dreams and folklore, then read this book. I personally greatly enjoyed reading it, and I can assure you that the book only becomes better upon rereading. This is quite something. For all its skill with visual elements, for the ingenious way the author uses color both in backgrounds as well as in lines, the most impressive part of the book is its narrative discipline. For much of the book I thought I was reading a couple of stories set in the same part of the world, united by the trippy visual imagination of the author and nothing else. The final section or story however ends up tying up all the book’s strands, even though it doesn’t do so neatly. Some asides, like an odd, seemingly LSD-fueled vision of the Wild West, don’t really find a place in the book’s final narrative concerns, but most do. 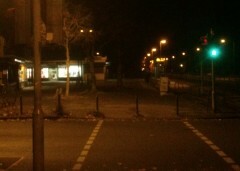 It is, as we find out at the end, a story about family, humanity, about modernity and modern man’s resistance to it. For all the book’s violence, the underlying emotion is a gentle sadness, a longing for a more natural time. The two odd characters on the covers are not trolls or beasts, they are “mountain men,” as the back of the book proclaims. Their beards and body hair are just drawn with such attention to detail that it flips over into mild surrealism. Hence the hair helmets. The artistic goal is one where the way the mountain men are drawn and the way trees, grass and bushes are drawn resemble each other. The men are truly becoming part of nature, and in the process they lose some part of their humanity. This is where Miyazaki is likely most relevant, with his stories of nature resisting man-made modernity, of some pockets of humanity allying themselves with nature and with the magic that is fundamentally linked to that nature, magic that has its roots in the connection of people with the soil and animals. There is a reactionary element to that kind of story, which has been discussed a few times in scholarship, but Miyazaki leverages that reactionary element with his intelligent manipulation of gender and class discussions. Karlsson…doesn’t, but I’ll get to that in a moment. At this point I’d just like to stress the way Karlsson’s book, despite looking like a surreal tale of madness, really does fit many of the ecological tales. In her influential 1962 study of pesticides, Silent Spring, Rachel Carson writes that, “[g]iven time […] life adjusts, and a balance has been reached. For time is the essential ingredient; but in the modern world, there is no time.” In some ways, The Troll King is a resistance to the loss of time in the modern world. Events in it happen in some kind of dream time. While there is a clear chronology that connects many parts of the book, others appear to speed up or slow down time to allow for things (skulls, mushrooms, trees and dead cowboys) to grow and die. Human agency doesn’t shape time, the processes of nature do. Uh. Can you say Dragonball? This attitude towards human agency also feeds into the book’s relationship towards language and myth. The longer the book continues the fewer lettering we get. The story starts relying on expressive images rather than on explanatory captions. Yet even before that, what few words we are given are rarely explanations and more emotional commentary by one or more of the people depicted in the panel in question. Karlsson’s lettering looks like very personal handwriting, so when he switches to a different character’s voice, I was at first taken aback (this, I suspect, speaks to the density of the book which made me assume that all details were calibrated exactly). The first two chapters, consisting of the marriage of the mountain men, and of a dwarf’s fever dream, are basically the only parts of the book with consistent words and voices. In a way, these two sections ease us into the book’s themes and concerns and having words at the beginning helps us jump the hurdle of the strangeness of the rest of the book. But there is another way to see this change. 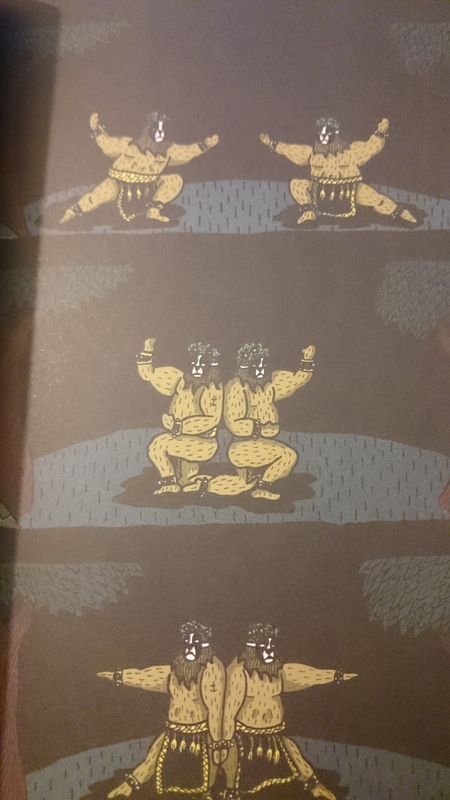 As the book progresses, it dives deeper into its themes of myth and creation, culminating in the tale of two chubby hairy green men burying a skull and digging up the dead cowboy from a vision they had. In Walter Benjamin’s discussion of language and divine creation, he discusses, I think, the idea that things have, originally, no name. Their mute language is a residue of the divine word of creation. According to this reading of Benjamin, it is with the Fall that language loses this immanence, this magic quality and starts referring to abstractions, to outside sources, to broad constructs of knowledge and culture. The book, for a while, until the two last chapters, reverses this process, stripping its story of the reliance on words and constructs. The mountain men, for example, describe themselves as “Ewoks,” and their marriage dance is maybe related to pagan rites, maybe to Dragonball Z (I admit that was my gut association because I am philistine trash, but, you know, why not). This relationship to language and signification seems to be an essential part of the book, and if we assume its centrality, then we immediately connect it to the overwhelming masculinity of it all. The book abounds in small chubby penises, and all the processes of procreation are specifically framed as bypassing the female element. Despite the book’s buoyant joy in using visual references to all kinds of pagan and neopagan takes on rites and liminal spaces, it does not appear to refer at all to the bible of neo-pagan nuttery, Robert Graves’ immensely readable book of questionable scholarship, The White Goddess. Graves’ story of the maiden-mother-crone, the universal Goddess, is completely subverted by Karlsson, whose book features a brown God of the woods, who looks as if he had been created from mountain men beard hair. This odd masculinity of myth can, I suspect, be read as a commentary on feminist theorists like the extraordinary Helene Cixous and concepts like the phallogocentrism. Given how central the binary is to Cixous, Derrida and other critics of phallogocentric thinking, it’s interesting that The Troll King has removed all womanhood from its text, in full embrace of phallocentrism, even as indeterminacy increases. Of course, the slanted take on procreation always implicitly engages discourses of feminity, and the way the book’s ending fits neatly into the canon of Western narratives also shows up the indeterminacies in the book’s middle as mere skirmishes with signification. But if we look at the way myth is masculinized here, we can ask more questions of the text. One is the connection of nations with its folklore. Surely, myth and similar narratives are among the most important stories that hold together the ‘imaginary communities’ of nations, as Benedict Anderson called them. And just last week I read a really good book on how masculinity shapes nationalist discourses and debates, Charlotte Hooper’s Manly States. The point here is that this book, which is set in a vaguely Western/Northern wood, with high rises merely shown in a few panels, should, I think, be read in the context of modern Swedish national anxieties. I cannot possibly do that, my knowledge of Swedish culture is meagre at best, but I have some pointers. One is the reflection of this topic in Hans Henny Jahnn’s immortal masterpiece Fluss Ohne Ufer, the largest portion of which is dedicated to two German men who move to the Swedish countryside to escape modernity. The other is something that turns up in two and a half panels, but is extremely specific – and both racist and possibly misogynist. These panels describe the mountain men going to town to buy groceries. In order to hide their strange exterior, they wear burkas. Black embroidered burkas. What’s more, the panels that show us the burkas are panels of their return to the wild: depicted are two humans in burkas, carrying a plethora of full plastic bags of the Swedish ICA supermarket chain. That image, of women in burkas carrying plastic bags of groceries is one that is exploited by various caricaturists. The humor here is based both on racist and misogynist assumptions. These two panels are instantly distasteful and repugnant, particularly since they are clearly supposed to be humorous, but there is nothing else in the book that directly takes up this line of discourse – except for the book’s take on myth and masculinity as I suggested before. It is quite impressive to what extent the book ties up all its concerns like that. It makes me dislike Karlsson as a person, but the artistic power behind this book is undeniable and the focus and density of it all is exceptional. Now and then I upload more recent pictures of my desk. This is from March(?) last time it was really orderly. 🙂 If you read one of my reviews, this is where the *magic* happens. For my birthday a year and a half ago, my sister brought me a cat, as, I suspect, a therapy animal/companion. I love cats, and my sister was right to suspect that my cat would keep the specter of suicide mostly away from my door. This year, she bought me a bunch of books, some of them cat themed. I’m saying this to explain that I have an obvious affinity to cats. My family has always had a cat and I genuinely missed having one around. I love cats. So when I come across a book that speaks to its author’s deep appreciation of feline companions, I’m already halfway convinced of the book’s quality. By cat-themed books I mean books about people who have cats. There are obviously also books about cats, written from a cat’s perspective, a genre that has some important forebears. I (badly) reviewed one of them here, ETA Hoffman”s Tomcat Murr. Many entries in this genre, somehow, have turned to the genre of the mystery novel, from Rita Mae Brown’s post-Rubyfruit Jungle work to the German novel Felidae (which I advise against buying because its author has turned into a deplorable creature and there’s no point in lining his pockets further. Get it from a library. It’s enjoyable, I think). But none of that here. This is about animals as companions. In these situations, animals often serve as agents of disorder, of emotional or empathetical destabilization of order or just as unreadable creatures beyond the reach of rational analysis. The raven in Charles Dickens’ severely underrated early novel Barnaby Rudge, companion to the simple minded eponymous hero of the novel, serves such a purpose, for example. In a way, its first appearance in Dickens’ novel is a culmination of several figures of incomprehension. That encounter with animals is something that we know from writers all over literary history, in the past century most powerfully expressed by poets like Elizabeth Bishop or James Dickey, but pets have a whole additional significance. More than Bishop’s gentle-but-threatening moose, pets are already connected to a domestic sphere. They are part of the machine of urban structure and architecture. They help us read and sometimes push against needs and asks. 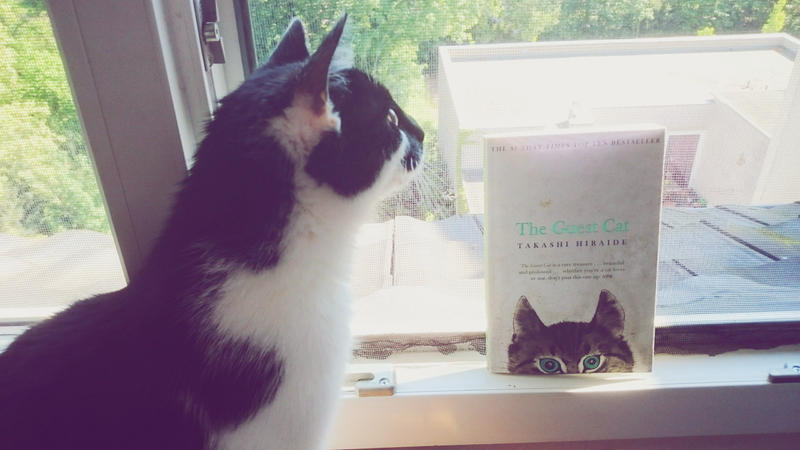 I say all this because that is exactly, I think, the role played by “Chibi,” the cat from Takashi Hiraide’s novel. Hiraide is a poet and the spare but efficient way the book is structured suggests the assured hand of a writer used to play tennis with a net, to paraphrase Frost. Chibi is a “guest cat” not in a semi-permanent sense, like a cat left behind with a cat sitter or a friend. Chibi is a frequent visitor rather than a guest, really. Her home is in the same neighborhood but she has taken a liking to the protagonists of the novel and spends quite a bit of time at their house. Her movements are not restricted, and her relationship to the protagonists is one largely of autonomy. The book charts the relationship of the protagonists to the cat from its beginnings to the end, telling a story of a middle aged man diverging from what appeared his set path in life to make small but important changes. The whole story is set to the backdrop of the country itself going through changes. Chibi, the curious cat, with her roaming ways, serves, if not as a catalyst, then as a figure of independence and divergence, helping the protagonists make sense of their changing lives. This “cat ownership […] on an ad hoc basis” is written without any tired insights into the mind of a cat. In fact, the cat’s itinerant ways and her unclear attachment to the protagonists allows Hiraide to situate the book between urban stories of pet ownership and the tales of encounters with wildlife, except: there are no epiphanies here. There is half a revelation in the final pages of the book, but it is one of contextualization, of understanding human agency and the restrictions they place on the freedom of animals among us. I have mentioned my limitations with regards to Asian literatures before here and here, but it never feels so acute as here where I’m left to speculate about the literary and cultural reception of Romanticism, particularly of the Wordsworthian kind, in Japan. Is the retreat from epiphany a choice by Hiraide, emphasizing the austerity and materialism of the novel, or is this typical of late-20th century literary writing in Japanese? The only non-fairy-tale book I have on my shelf to compare is a brief manga by Junji Ito. Now, if you are a reader of this blog, you may recognize the name from some intense praise I offered for his work a while ago. Junji Ito is one of the best and most accomplished writers of horror comics I have ever read. His work may sometimes seem too direct and unsubtle, but for me at least, it has its desired impact of scaring me or at least appearing sufficiently creepy. 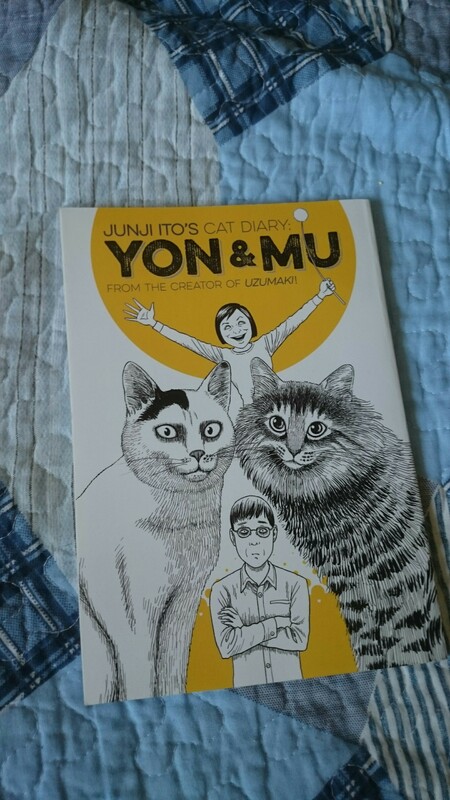 This comic book, published by Kodansha Comics in a translation by Stephen Paul, as Yon & Mu, is basically a memoir of acquiring cats. Junji Ito offers his usual approach of injecting every frame with some modicum of dread, fueled in this case by his lack of appreciation for cats. So when his wife forces two cats on him, he indulges in sharing the dread they invoke in him. This dread is clearly played for laughs. In a way, the whole book is a kind of deconstruction of Ito’s poetics, with every sweaty forehead and grimacing face showing us how much the effect of his more serious books depends on audience collaboration. At the same time, some of the ‘serious’ dread carries over, emphasizing an incipient metaphysical dimension to the story and cat ownership in general. The book may seem loose, but if we look close, it ticks a lot of boxes relevant to the genre. We get a kind of vision, but they do not carry the weight either of classical or of modern epiphanies, so, as a way to gauge a cultural environment for an understanding of Takashi Hiraide’s novel(la), it’s not greatly of help. Let me, however, recommend the book, and, while I’m recommending cat related comics, let me additionally recommend the adorable manga Chi’s Sweet Home by Konami Kanata, published by Vertical in a translation by Ed Chavez. It is written to reflect the pet’s perspective, so it doesn’t fit my thoughts on The Guest Cat, but it is just the most adorable comic you’ll read in a long time. Ah, and for a final recommendation to close out this paragraph, you should read Grant Morrison’s comic We3, a contemporary take on Richard Adams’ classic 1970s novel The Plague Dogs. Morrison mimicks many of the conventions of animal-perspective storytelling, but undercuts them by exploring questions of speech and technology, autonomy and language. It’s a story of three pets fleeing the laboratory that planned on turning them into cyborg killing machines. Donna Haraway’s work has surely contributed to Morrison’s thinking here. Technology, interestingly, plays no role in The Guest Cat despite its setting in the 1980s. In fact, the book is set precisely at the end of the Showa period, which ended with the death of Emperor Hirohito in 1989. Human artifacts here are more of the wood and concrete kind. The book begins with the protagonists, a married couple, moving into a house. Hiraide spends an enormous amount of time explaining to his readers the exact layout of the neighborhood, how the house, which is itself a kind of guest house, relates not just to the lerger mansion on the same grounds but also to the neighboring houses and the street. The relationship between all these places, these narrowly defined small territories is almost geometrically exact – in fact, due to the odd angling of the house vis-à-vis the street, a trick of the light sends the image of approaching passengers through a knothole in a perfectly positioned tree onto a wall in the protagonists’ house. This sense of proportions and of the interaction of light an architecture is reminiscent both of the work of Gaston Bachelard and, particularly, Junichiro Tanizaki’s brief essay In Praise of Shadows, In it, the famous (and excellent) novelist describes the role of darkness and light in aesthetics, but he particularly discusses effects of shadow and reflection in architecture. One of his observations, of light reflecting an image onto a wall, off some gold leaves in a decoration, comes remarkably close to the appreciation of light in Hiraide’s novel(la). 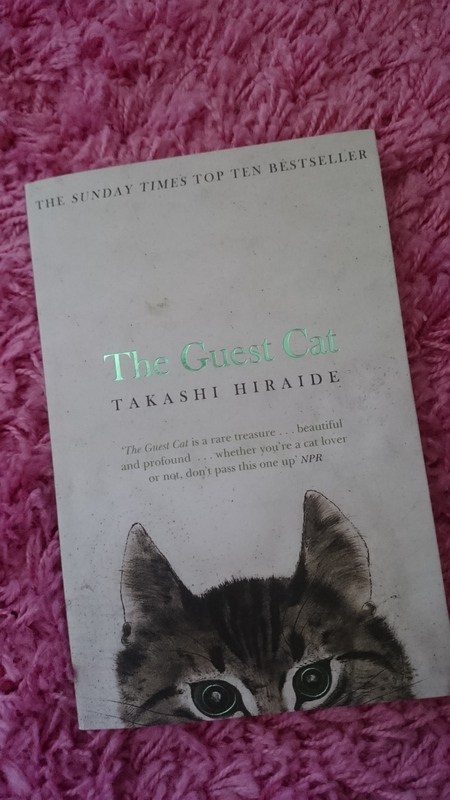 It’s interesting that The Guest Cat would be interested in light and its effects on rooms, and Tanizaki interested in darkness and shadows, particularly, because both books have a sense of the nostalgic about them. Tanizaki ends his essay with a lament on the advent of electrical light and the resultant omnipresence of light, whereas Hiraide constructs the strangest little simple abode that appears almost like an ancient object to which modern humans brought stoves and computers and the like. After about 1,500 words of talk, I am not sure I conveyed to you that, with all this, The Guest Cat is a very good book. It sidesteps easy sentimentalism without losing emotional resonance. It creates multiple layers of significance by superimposing people and events on certain roles and things. One example is the way the author blends the Emperor’s death with the much smaller death of his landlord. The writing is not always disciplined, sometimes the author indulges in speculations about the cat’s presence in their lives that drag on for a bit. Like many men, the author likes to hear himself talk and he cannot always control the detrimental effects this has. This isn’t helped by the patchy language that sometimes slips awkwardly between registers, something that I tend to lay at the feet of the translator. Yet all of this is nitpicking. The writing is usually elegant, and the author modulates the architecture of his novel very well. 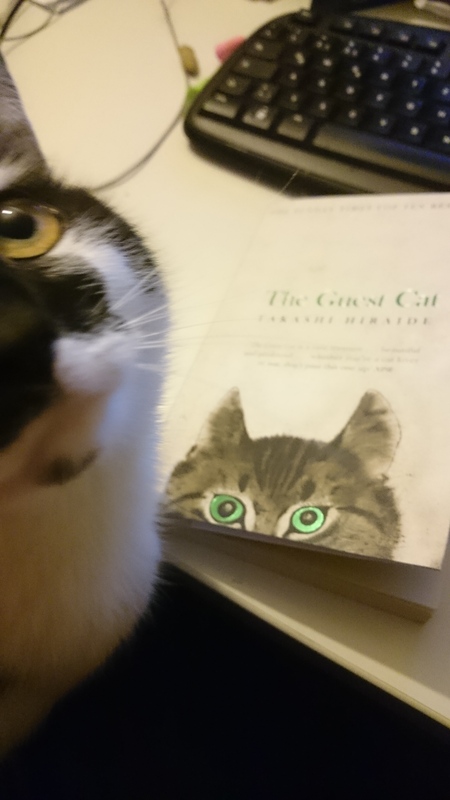 While the aforementioned memoir by Junji Ito is exclusively of interest to people who love/have cats, The Guest Cat does not rely on shared affinities. It is a very nice book. It never attempts to go beyond its small confines of offering a small episode in the life of a writer, despite its reach into the larger fabric of the historical moment. Like a poem, then, say, one of Mary Oliver’s small ones or, more accurately, the luminous work of Wisława Szymborska, who populated several of her poems with cats, declaring once that “D[ying]—you can’t do that to a cat.” Hiraide does not have Szymborska’s precision, but that would be a tall order anyway. Yet with her, he shares a sense of how cats interact with spaces, with things and routines, how cats resist – and attach themselves to their human companions. It is something that rings very true to me, which returns us to the bias I admitted to in the first sentences of this review.